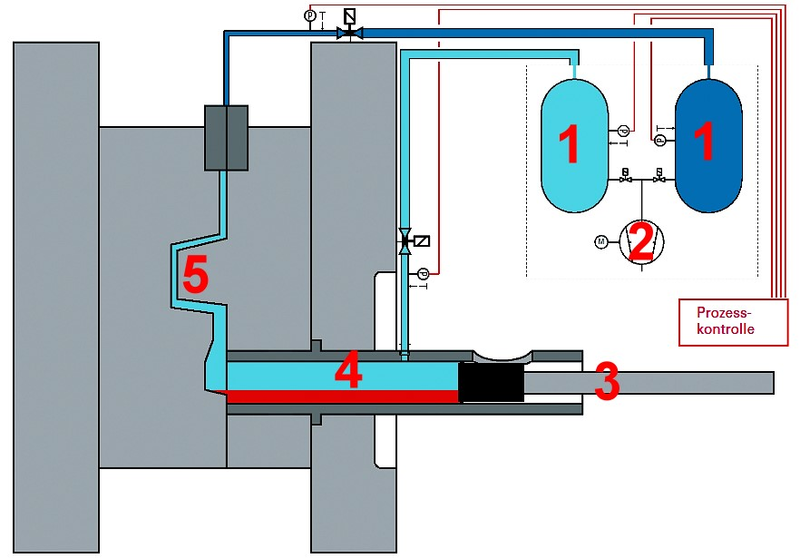 Process for evacuation of the mold cavity in die casting. The task of the vacuum system in a die casting plant is to evacuate a certain amount of air from the mold cavity and the shot sleeve in a very short time. By doing so, air inclusions in the casting are prevented. Conventional procedures only extract the air through one or several air relief valves with relatively low pipe cross sections directly on the die casting mold. In the multi-stage vacuum process (e.g. 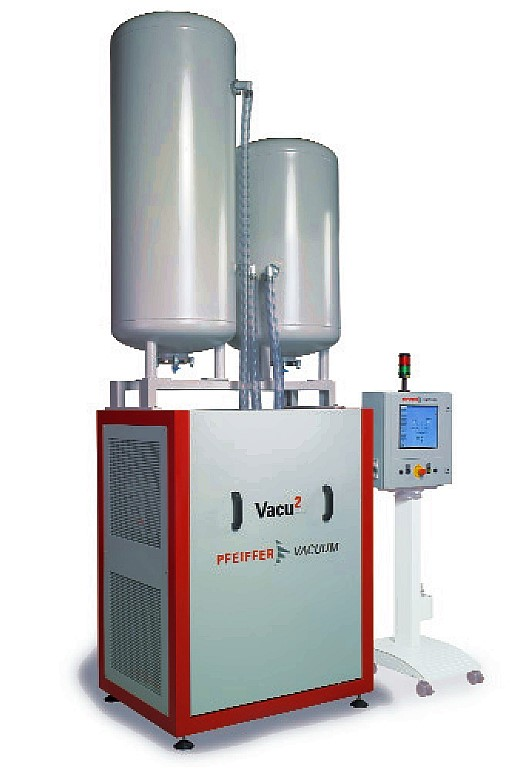 the Vacu2system from the company Pfeiffer Vacuum, schematic diagram in Figure 1), the shot sleeve and mold cavity are evacuated in two stages.During the first stage, the air is extracted via a large pipe cross section directly on the shot sleeve. This enables the desired end pressure in the shot sleeve and in the mold to be achieved within a very short time. In the second stage of evacuation, as in conventional vacuum processes, air is extracted on the mold. As the desired pressure is already achieved in the first stage, the second stage serves to maintain the pressure by pumping out air which has entered the mold due to leakage. The pressure pattern in the two-stage process is completely different from that of the single-stage process (Figure 2). Container volumes, starting pressure and connection cross sections are designed for the first stage so that - unlike in the existing processes - a balance is created between the container and the mold cavity and after only 0.5 to 1.0 seconds an absolute pressure of around 50mbar can be achieved in the mold cavity. In such fast processes, the leakage rate is of hardly any consequence. The pressure curves differ only marginally in the first stages (Figure 2). Significant heat exchange does not take place either, so adiabatic changes to the conditions of the gases can be accepted. The considerable changes in temperature which take place in an adiabatic expansion must of course be taken into account (Figure 3, Stage 1). The starting value - at the beginning of the second stage - undercuts the classic process. As almost the entire amount of air is already removed in the first stage, volume and available time play only a secondary role in influencing the second stage. 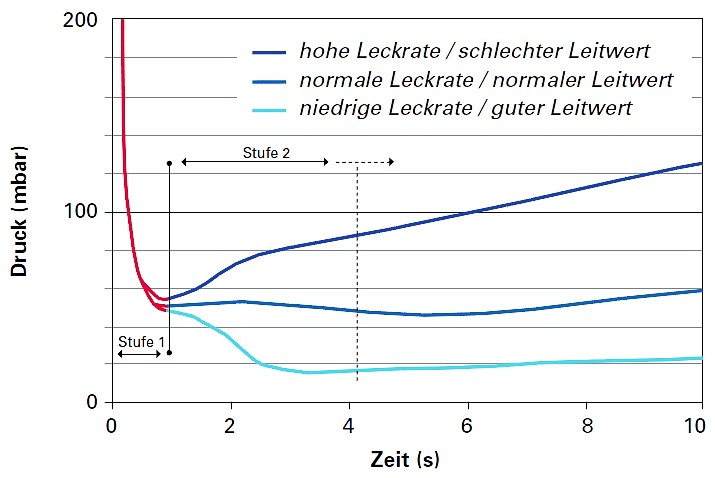 The larger the volume of the casting and the lower the remaining available time, the more the pressure values change (Figure 3, Stage 2). 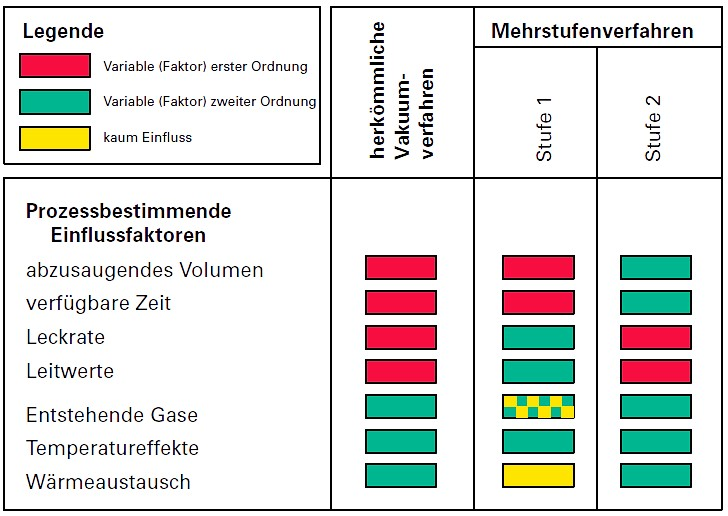 The pressure level changes more slowly during the second stage of evacuation than during the first stage. It can both rise and fall, depending on the leakage rate and the conductance of the overall system. End pressures of 20mbar are achieved in practice already (Figure 2). However, a stable progression of the pressure curve is even more important than the absolute value. Variations in the process conditions lead to only small changes in the vacuum achieved. It has been proved with an analysis of influences that changes in one stage are reduced in the corresponding other stage. Due to these changed dependencies, molds with higher leakage rates, molds with core sliders, molds with less precise sealing or molds with very large volumes are, in principle, made accessible to vacuumcasting.The process control is done through pressure measurements at different places at different times in the casting process. In the control, this data is processed to give data which is relevant to the process and therefore allows an exact statement to be made about the current condition of the system. If limits which are defined by the die caster are exceeded or not reached, the system reacts with a warning, which allows reject counts to be reduced considerably. 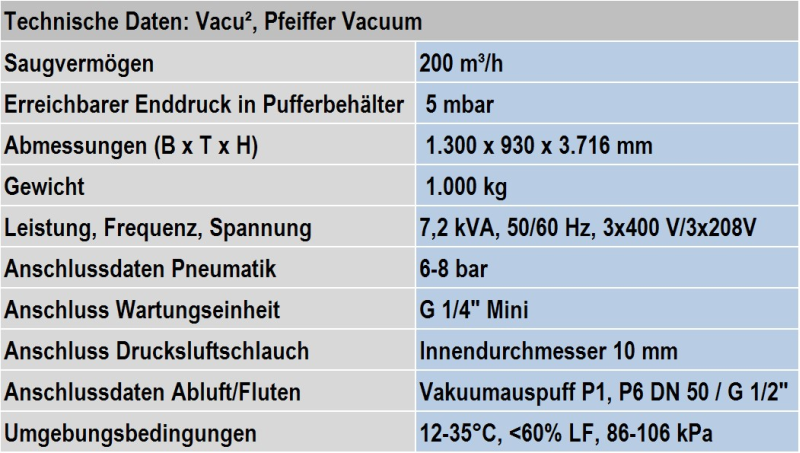 A multi-stage vacuum system Vacu2 from the manufacturer Pfeiffer Vacuum is shown in Figure 4. The technical data for the standard model is listed in Table 1.